UK-DC Offer a a range of general and high reach demolition services in Gloucestershire as well as throughout the UK. 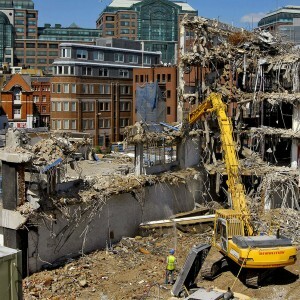 UK-DC have been involved with all manner of demolition projects, from small private properties to large multistory buildings, along with more specialised and non standard building types. We are able to efficiently project manage all types of demolition projects and advise on the quickest, safest and most environmentally sound course of action. All our demolition work is carried out by our qualified team using cutting edge plant equipment and machinery. This ensures work is carried out to schedule and with the up most safety and environmental concern. Our typical clients vary from private land owners through to local councils, construction companies and major property developers. We utilise structural engineers calculations, building specification, scaffolding and specialist high reach equipment and excavators to safely dismantle & demolish the most demanding high-rise buildings whilst maintaining our excellent safety record. Structures are dismantled floor by floor until such time the lower floors can be demolished by heavy machinery. For more information about UK-DC Demolition Services please contact us by email or telephone where we can arrange a meeting or on-site survey were applicable.